Stay in tents pitched over a beautiful camping ground near Bangalore and participate in exciting adventure activities. Arrive early and spend the day trying your hand at rope course activities like Burma Bridge, slack line, monkey crawl and many more activities, including archery and target shooting. Invite your friends or family for a game of volleyball, badminton, cricket or basketball. For something a bit relaxing, you can also spend some time in the swimming pool. This adventure camping trip in Bangalore is perfect for families and groups of friends, looking to for a fun and easy adventure near Bangalore. Located on a sprawling patch of greenery, your campsite for this day adventure is located only a 10-min drive from Electronic City. The campsite is peppered with towering sandalwood, coconut and mango trees, making for exciting adventures in the midst of nature. The camping ground is equipped with a swimming pool. You'll be staying in tents on twin/triple-sharing basis. This package also includes buffet meals from dinner on day 1 to lunch on day 2, served at the campsite. • Participate in activities like Burma Bridge, archery and more. • Stay in tents pitched at a picturesque campsite. • Spend the day having fun with your family or friends. • Escape from the city for a day of adventure. This adventure camping trip in Bangalore is a non-strenuous activity. However, if you have asthma, heart conditions, and spine or knee problems, please consult your personal physician before this trip. For cancellations made more than 24 hrs before check-in time of the Bangalore adventure camping trip: 50% refund. For cancellations made 12-24 hrs before check-in time of the Bangalore adventure camping trip: 25% refund. For cancellations made less than 12 hrs before check-in time of the Bangalore adventure camping trip: no refund. Check-in as well as check-out time at the Bangalore campsite is 16:00 hrs. These timings are very flexible, allowing travellers to check-in at any time and check-out 24 hrs later. One entire meal cycle is included in the package, for the 24 hrs that you'll stay at the campsite. Synthetic swimming costumes are mandatory in order to enter the swimming pool at the campsite. The package only includes 7 adventure activities from the several on offer. Travellers may book additional activities on the spot. Bookings for children younger than 6 years are not charged. Bookings for children aged between 6-12 years are charged at INR 1,350 per child. Bookings for children older than 12 years are charged at full price. The tour operator reserves the right to cancel or alter the itinerary of adventure camping in Bangalore to maximize the safety of travellers as well as staff. Travellers will be required bear any additional costs arising due to such a change in itinerary. The tour operator takes utmost care to ensure safety of the travellers and shall not be held responsible for any mishap, accident or loss of life during adventure camping in Bangalore. There is no pick-up for this Bangalore camping adventure. There is no drop-off for this Bangalore camping adventure. 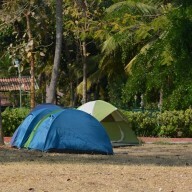 Day 1 of adventure camping in Bangalore: Check-in and enjoy! Arrive at the campsite by 16:00 hrs. You can spend the rest of the day at leisure. Take a stroll to explore the beautiful camping ground, or head directly for the several adventure activities on offer. You can select any seven activities from a list of adventures such as archery, target shooting, Burma Bridge, slack line, monkey crawl and many more. Later in the evening, a campfire will also be organized. Overnight in tents at the Bangalore campsite. Go camping in Bangalore and try your hand at exciting new adventures! Wake up and take your time to laze and stroll around the beautiful campsite. You can spend the rest of the day at leisure. Engage your fellow campers in a game of cricket, basketball or volleyball at the campsite or have fun in the swimming pool. For something relaxing, there are indoor games like badminton, table tennis and board games on offer. You'll check-out by 16:00 hrs. Your trip ends here. All equipment required for adventure activities: safety harness, helmets, rope course etc. Overnight in tents at the Bangalore campsite. Check-in time at the campsite is 16:00 hrs. This time is very flexible. You'll be accommodated in tents on twin/triple-sharing basis. A sleeping bag and mattress will also be given to you. Today's meal package includes evening tea with snacks and dinner. Generally, lunch and dinner include rotis/kulchas, a chicken and vegetable starter, chicken and vegetable gravy, flavoured rice and dal, assorted salad and a dessert. Today's meal package includes breakfast and lunch. You'll check out by 16:00 hrs. Bangalore is well-connected to most major cities of the country via flights to the Kempegowda International Airport and trains to the Bangalore City railway station. You can board a flight to the airport or take a train to the railway station and travel to the campsite via road in hired private cab/taxi. The campsite is located 2-hr drive from the airport and 1-hr drive from the railway station.